From record-breaking rounds to near death experiences via a Tiger inspired ace, TG hears some of golf’s most extraordinary stories from the people they happened to. You may have seen some of the videos already, but now Brett Stanford, Taylor Crozier, David Johnson, Tony Aarts and Greg Eason have all shared their stories - and they are pretty incredible. I’ve been playing golf for about 15 years and while I’m a mid-handicapper with a decent shortgam, the longest putt I’d made before thi was around 40 feet. My friends and I discovered the record was 125 yards and decided it would be fun to have a go at breaking it. Finding a course in good shape and willing to give us exclusive access to a hole for a significant length of time was tricky, but the idea of a Guinness World record being set excited the manager of Point Walter in my home city of Perth, Australia, so he gave us exclusive access to the 5th hole for an entire day. Early on we realised the previous mark would be really hard to beat, but we were optimistic that it was possible. We just needed to get it going on the right line at the right speed... simple! One of the big issues early on was consistency. When you are trying to make a full swing with a putter it is very easy to spray the ball or top it. When I started to focus on a more compact putting motion it proved to be a good move. Shortening the swing really helped me to keep the blade at the right angle and aided consistency. After that I needed to nail the pace as I was short, long and even slammed one into the flagstick. That really hurt. It was about 90 minutes in and my friend Scott was shouting “Get in. Come on, get in”. His arms were waving, his volume was increasing and then, bang, I heard the ball hit the flagstick and the guys groan in disbelief. Would I get any closer than that for the rest of the day? It seemed like the answer was no, but just as things were beginning to get tedious, I hit one on the right line, right out of the sweet spot. It travelled up the left side of the fairway, onto the green and began curling down towards the hole. Again, I could hear Scott egging it on. He encouraged it and encouraged it and then he started screaming and celebrating, which was my cue to go nuts. I’d broken a Guinness World Record and it felt fantastic. I haven’t really thought about it, as I am too busy enjoying this one (although if you pushed me, it would be something alternative like longest putt holed from a moving golf cart). In terms of my tips, I would say find a well-conditioned hole that does not have a bunker, water or rough in front of the green and be prepared to be there for a long time. 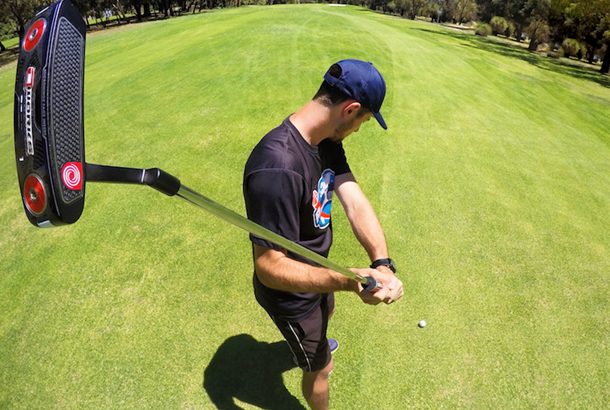 Holing a putt the length of 9-iron shot isn’t easy, but I am proof that if you persist it is possible. Jose Maria Olazabal once holed a 9.2 MILE putt... on Concorde! He was trying to beat Brad Faxon’s 1997 effort of 8.5 miles and his ball travelled the length of the aircraft’s 150-foot cabin and into the hole in 26.17secs. With Concorde travelling at 1,270 mph, the ball was actually in motion for 9.232 miles. Concorde captain Dave Studd was especially delighted as he had lent Olazabal his putter. 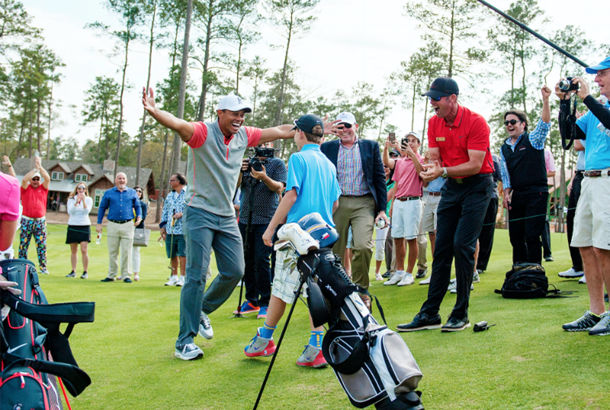 I could feel my heart beating really fast when I stepped up to take the opening tee shot on Tiger woods’ new course for juniors at Bluejack National. If it wasn’t nerve wracking enough that I’d been selected to play with one of my favourite golfers, there was also the biggest crowd I have ever played in front of in my life. What would happen if I flubbed it? It was a lot for an 11-yeaer-old to think about, but I tried to stay calm and concentrate on [picking the right club. In an ideal world, I would have hit my driver, as it is my favourite club, but I can hit a solid driver 220 yeards and this hole was only 81 yards lng, I convinced myself to hit a pitching wedge, but just as I was about to play I changed my mind and sawpped to a sand wedge. When I struck my shot, I was a little disappointed as I thought it was going to be way too far to the left, but when it landed it began taking the slope to the right. It got nearer and nearer the hole and then it went in. I kind of jumped and then Tiger grabbed me, gave me a big bear hug and shouted: You have got to be kidding me. I got to live over and over again at school the next day. Every time I went into a new class my classmates would give me a round of applause and the teacher would play the video of my shot on YouTube. It was nice, but a little embarrassing. I get asked about my favourite player. Everyone expects it to be Tiger Woods, but it’s actually Jordan Spieth because he’s also from Texas and has been playing really well recently. Like Jordan and Tiger, I’d love to win the Masters at Augusta, but unlike them I am still not certain if I want to be a golfer, as I also love baseball. If I do become a golfer hopefully I will have a few more holes- in-one in front of big crowds, as this one was really cool. Your first ace is always special, even if you’re Tiger and have had 18 more. Woods was just eight when he holed out at Southern California. I’ll never forget the 2016 Ryder Cup. Not because the United States finally won the trophy back, but because some members of the European team allowed me to live a phenomenal golfing experience. My friends and I had arrived at Hazeltine on the Thursday and found a spot beside par-3 8th green to watch a few groups on their practice rounds. The first featured Rory McIlroy, Henrik Stenson, Justin Rose and Andy Sullivan. “Henrik looked at the crowd, stepped towards us and said: ‘Who said that?’ My first thought was to run, but he didn’t look too angry, so I put my hand up. ‘Let’s get you out here,’ Henrik said. “He must have been thinking let’s let this guy embarrass himself, but I was so excited about being on the same green as some of the world’s best golfers that I didn’t think about the putt until Justin ran over and threw down $100 to make things ‘a bit more real’. “At that moment the size of the crowd, the enormity of the moment and the fact that I am not actually a very good putter hit home! I tried to buy some time by asking Henrik how he had read the putt. ‘You told me you have got it, so go ahead and hit the putt,’ he smiled. “I walked around the green to settle my heart rate and was interrupted by Rory. My sons and I had watched him win the FedEx Cup a few days earlier and now he was speaking to me. It was a rush. ‘Andy’s putter is the one we’ve been missing with, so it’s the one you’ve got to use,’ he said, handing me a club that was shorter than my normal putter. It felt awkward to say the least. Suddenly 13 feet looked more like 40. If you’d asked me how many times out of 10 I would expect to find the hole in that situation, I’d have said zero. “In my head I recall having very little confidence that it was going in, but watching the video back I take a step towards the hole and begin celebrating while the ball is still rolling. Clearly my adrenalin was pumping in a big way. “It was an incredible moment. The players seemed to enjoy it as much as I did and we relived the moment when I was invited onto the range for some pictures with them later in the day. 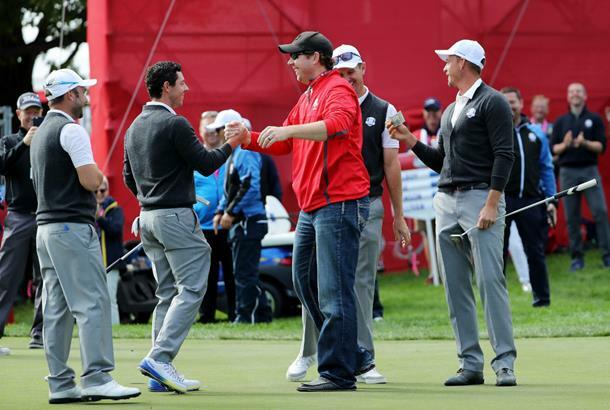 “Then Rory posted the video of my putt on social media! Suddenly everyone wanted to speak to me. I was live on CNN, live on ESPN Sports Center and Good Morning America. Then on the Sunday night I was own to New York for the Late Show with Stephen Colbert (I took part in a sketch where I made a putt after interrupting the presenter when he was playing a round of mini golf). But the best was yet to come as some people from Augusta heard me on the radio and invited me to the first round of this year’s Masters. I play golf on the Magnolia Landing course near my house in North Fort Myers, Florida two or three times every week. 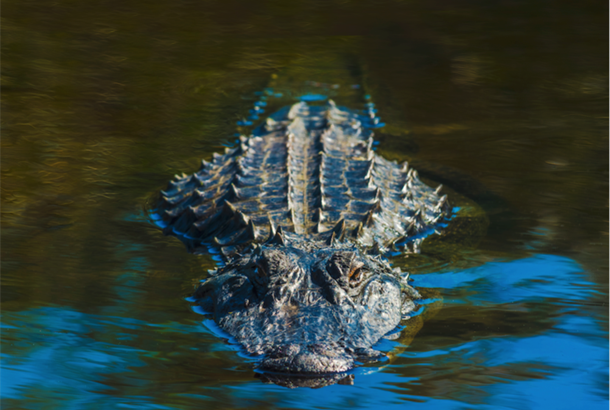 It is a beautiful course, with lots of water features that are home to plenty of alligators. Before this year I had never heard a bad story about any of these animals, but on February 8 a 10-footer decided to try and have me for lunch. “The incident happened on the 4th hole. I’d hit my shot onto the green and instead of riding in the cart around the lake; I grabbed my putter and took a short cut across the beach area. I had walked this route 20 or 30 times in the previous six months with no alarm, but on this occasion I heard a big splash. I quickly turned round and then even more swiftly jumped in the air. The course’s biggest alligator was right there. “He bit my foot, started shaking his head and pulled me onto my back. I remembered getting bitten by a dog when I was younger. The mutt clamped its teeth around my leg and only removed them when I hit it on the head. Given this, I tried to do the same to the alligator. I lifted my putter and smashed the gator across the head as hard as I could. “It was like hitting a barn door. The gator did not inch. By now I was up to my knees in the water and in real trouble. If I had got up to my chest or been turned onto my stomach it was all over. I figured I had two or three seconds to save my life, so I stopped hitting him randomly in the head and started concentrating on his eye, as I thought it might be a weaker spot. Thankfully, this made a difference. After a few blows to the area, he let me go and I scrambled back up the beach and into the arms of the guys I was playing with. “Amazingly, the whole incident took less than 20 seconds from start to finish. And even more incredibly, I escaped with a swollen foot and four stitches, so was able to get back on the golf course after a couple of weeks. Australian golfer John Lahiff was attacked by a crocodile when he went to retrieve his ball. The 75-year- old startled the four- foot predator as he reached into a pond, and it locked its jaws onto his leg. it was just sunbathing.” Crocodile warning signs alert players to the dangers at Queensland’s Palmer Sea Reef Golf Course. He was taken to hospital with lacerations. "I shot 91, 95, 90... as a Tour pro": Leicester-born former US college superstar Greg Eason’s nightmare start to his season. After my first three rounds of the season my scoring average was 92. Not bad if I was a 25-handicapper, but not great given I’m a tour pro. Looking back, my issues began in the off-season. I’d developed a technical aw that caused some huge misses both left and right. a cut. Then the weather turned for the worse. 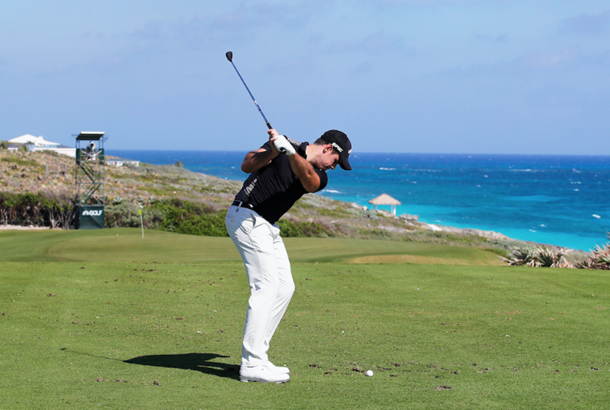 I’m not sure if you have seen any pictures from The Bahamas Great Exuma Classic, but it was brutal. Anything that wasn’t nailed or strapped down blew away and the rain bucketed. In these conditions you need control of your golf ball. I most definitely did not have. Including the practice days, I lost 32 balls and towards the end of my first round I very nearly ran out of balls. On 18 I lost my tee shot and then hit my fourth shot into a hazard on the right-hand side of the fairway. I then hooked my last ball OB on the left. Luckily I found the ball I had hit into the hazard on the right. I didn’t even think about it. I wasn’t going to make the cut, but if you are on a golf course you might as well try and make it worth your while. Also, we were in the Bahamas, so a weekend on the beach didn’t sound bad! Unfortunately my second round was four strokes worse than my first. I’d have been shell-shocked if I had shot 91-95 in my first ever Web.com Tour event, but fortunately I’ve played the circuit for three years and have top 10s, so I know I’m capable. But my second event of the season started just as badly. I shot an opening 90, including a decuple bogey 15 on the final hole – the highest single hole score in Web.com Tour history. I bumped into Australian pro Rhein Gibson, who offered to look at my swing. He pointed out a couple of issues and suddenly my technique felt much better. I don’t really do social media, but he soon explained that my scores had made me a bit of a Twitter sensation and that ESPN.com had been doing some features on my poor play. This really motivated me for the final few holes and I compiled a bogey-free 68. It was the third best round of the day and saw me claim another Web.com Tour record. No-one has ever played two consecutive rounds with a bigger difference in scores than my 22 shots. So where does this all leave me? I need to play some good golf over the rest of the season to achieve my goal of getting a PGA Tour card. And it leaves me optimistic that I’ll do just that. A lot of people will be astounded by this unerring positivity, but until this minor blip my career has been on an upward spiral ever since I left Leicestershire for a golf scholarship at the University of Central Florida. When I left the Sunshine State I’d won seven collegiate titles, been voted one of the top eight College golfers in America twice and gained my Canadian Tour card. I finished fifth on the 2014 Canadian Tour Order of Merit, which got me my Web.com Tour card for 2015 and three years on I’m still here. It has been a tough start of 2017, but it’s a very long season and there is no point in looking back. Mike Reasor was a 1970s journeyman pro on the PGA Tour, but he does have one claim to fame - shooting the highest score ever by a player who made the cut. He posted a weekend 123-114 (93 over!) at the 1974 Tallahasse Open, only using a 5-iron and swinging one-handed. Why? He went for a ride on a horse after his second round, but fell off, tearing ligaments and injuring his left shoulder. He refused to withdraw so he could finish to claim a cheque and qualify for the following week's event (which he had to withdraw from through injury).